The headlines proclaiming the availability of “simple new blood tests” to diagnose tumours show how advances in the field of cancer diagnostics have caught the media’s attention recently. These emerging techniques could have big implications for health insurance, especially Critical Illness (CI) products where protection against the risk of cancer plays such an important part. The most prominent new techniques are based on blood samples - often combined with DNA sequencing methods - referred to as “liquid biopsies.” Another method in the spotlight is refined imaging technology, such as MRI scanning, which allows differentiation of normal and cancerous cells. Currently, cancer is diagnosed by histopathological evidence from a tissue sample extracted in a biopsy and examined under a microscope. This methodology is essential for diagnosis of almost all cancers, unless taking a tissue sample is too risky (for example, in the brain). Results of the histopathology, together with physical examination and imaging tests, form the basis of cancer staging - the method of describing the extent to which a cancer has grown and spread, either locally or to distant sites in the body. But what if this established process is overhauled by the advent of biomarkers that offer a different type of information on cancerous cells? It is important to note that none of the new tests has been tailored for cancer diagnosis. Most are being applied where cancer diagnosis has already been made using conventional methods. The goal in using the new technology is to improve outcomes in cancer patients and this will remain the focus for the near future. Despite the media’s focus on the new tests’ potential as diagnostic tools, and the rush of companies offering new blood-based cancer tests, the value of the currently available tests for diagnosis remains unclear. A liquid biopsy is not useful for screening at this time because test accuracy is unknown, and could be a long way off. Other detection techniques are even less advanced. However, while these new technologies develop, it makes sense to revisit the language in CI benefit triggers and consider a future where new tests could lead to vastly different evidence for cancer claims. After all, should liquid biopsies become the gold standard for cancer diagnosis and have proven accuracy, the requirement for histopathological evidence may no longer be possible to uphold. On the other hand, further developments may come along with measurable thresholds, which could actually help the insurance industry in phrasing severity levels and cover cancer of specified severity, or critical cancer only. 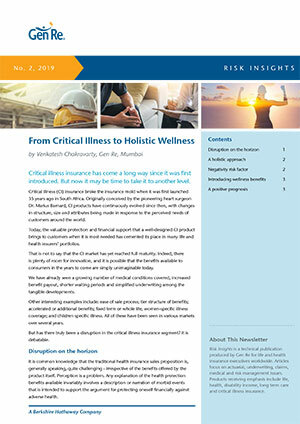 Cancer is the leading cause of claim under CI insurance, and its diagnosis has the strongest impact on the insurers’ experience. So it is important to review disease definitions regularly, adjusting them to the highest standard in terms of being future-proof and following objective, measurable severity criteria. Ensuring that cover continues as substantial support following diagnosis of a life-threatening disease, rather than a payout for incidental findings of an asymptomatic one, is crucial. 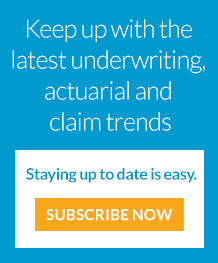 Otherwise, if common minor diseases are being covered where no substantial insurance need meets significant benefit payouts, CI products could become unaffordable. 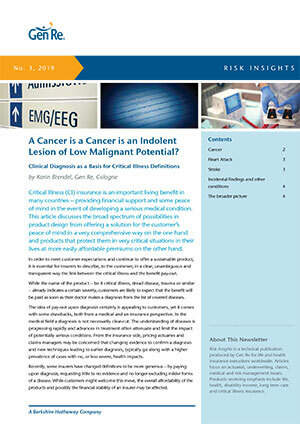 For more on how advances in cancer diagnostics could affect the insurance industry, read my recent article.